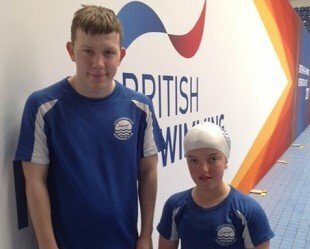 Georgie Howell and Caleb Grace both travelled to Sheffield for 4 days of tough competition 27-30/04/17. We met swimmers from around the World – Canada, Japan, Uzbekistan, USA, Germany, to name a few. We saw both British and World records broken; above all it was both inspiring and humbling to see people overcoming their disabilities and racing – fast! Final positions in all the races were determined by British Disability points. This meant our swimmers were up against all classifications, irrespective of age. For each event there were 3 finals swum. The top 20 swimmers who were IPC classified went into the two World Series finals. Both our swimmers just have British, not IPC, classification. These finals were seeded on time, but again winners were based on disability points. This meant you did not know who had won until the last swimmer in the 2nd final had swum. The next 10 British swimmers went into the British final. Excitingly Georgie made the British final in the 100m breaststroke having swum a new PB in 1:53.50 finishing 21st overall in the heats. It was a tough final and Georgie missed out on a medal by just one disability point, finishing 4th! A brilliant achievement – there were around 90 swimmers in this event. Both swimmers performed well over the four days. Caleb’s best swim saw him achieve 2.49 second PB in his 100 breaststroke, something he has been working hard on improving in training. Georgie also showed how an effective turn really does make a difference as she gained on the S6 swimmer in the next lane every time on her turns with a better faster rotation and underwater phase. Well done to both of you. This meet is one of the largest open competitions for para-swimming and the highlight of the domestic para-swimming events calendar. A not-for-profit club run for its members, affiliated to Sussex County ASA and Swim England South East.